Women's Tea: Alvita, Earth Mama, Weleda Nursing Tea, Traditional Medicinals, Yogi, Celestial Seasonings! • Black Cohosh Root: Black Cohosh (Actaea racemosa) roots have been traditionally used for more than two centuries by Native Americans and Europeans to help support women's health. Alvita Black Cohosh Root Tea is made with quality, organic Black Cohosh root, and holds a beautiful caramel color with a mild bitter taste and a distinct earthy fragrance. 24 bags. • Heartburn Tea: Heartburn Tea is a delicious and calming blend provides a cool hand to anyone with heartburn! Made with relaxing, coating Marshmallow Root and tummy soothing Lemon Balm, Chamomile and Spearmint, and astringent Red Raspberry Leaf for a flavorsome after-meal soother that helps turn down the heat. Naturally caffeine free, easy to brew tea bags. 100% recycled. Steep, sip and enjoy! 16 bags. BUY NOW! • Mama To Be Tea Sampler: For the pregnant mama who has everything: nausea, heartburn, anxiety and labor on the horizon. Offering Earth Mama Angel Baby's best sellers in one easy-to-try sampler box. Ginger-minty Organic Morning Wellness Tea is a soothing way to help get you through those morning nausea that frequently last all day. Delightful and calming Organic Heartburn Tea was warmly made to help turn down the furnace in your belly. Organic Peaceful Mama Tea is made with relaxing herbs in a luscious blend to help relieve a mama's busy head and restless body. And tasty Organic Third Trimester Tea blends beneficial herbs mainly to nourish all those mama parts and preparing for your angel baby's arrival. Naturally caffeine free and 100% recycled. Steep, sip and enjoy! 16 bags. ORDER NOW! Ingredients: MORNING WELLNESS TEA: Zingiber Officinale (Organic Ginger) Root, Mentha Spicata (Organic Spearmint) Leaf, Matricaria Recutita (Organic Chamomile) Flower, Citrus Sinensis (Organic Orange) Peel, Melissa Officinalis (Organic Lemon Balm) Leaf, Mentha Piperita (Organic Peppermint) Leaf. PEACEFUL MAMA TEA: Melissa Officinalis (Organic Lemon Balm) Leaf, Matricaria Recutita (Organic Chamomile) Flower, Avena Sativa (Organic Oatstraw), Citrus Sinensis (Organic Orange) Peel, Rubus Idaeus (Organic Red Raspberry) Leaf. THIRD TRIMESTER TEA: Rubus Idaeus (Organic Red Raspberry) Leaf, Mentha Spicata (Organic Spearmint), Urtica Dioica (Organic Stinging Nettle) Leaf, Avena Sativa (Organic Oatstraw), Matricaria Recutita (Organic Chamomile) Flower, Rosa Canina (Organic Rosehips), Medicago Sativa (Organic Alfalfa) Leaf. HEARTBURN TEA: Althea Officinalis (Organic Marshmallow) Root, Mentha Spicata (Organic Spearmint) Leaf, Matricaria Recutita (Organic Chamomile) Flower, Melissa Officinalis (Organic Lemon Balm) Leaf, Rubus Idaeus (Organic Red Raspberry) Leaf..
• Milkmaid Tea: Organic Milkmaid Tea was created for those times when the "milk of momness" needs a little support. Tasty iced or hot Organic Milkmaid Tea is a aromatic and soothing blend of organic herbs traditionally used to help support healthy breast milk production. Combined with traditional herbal galactagogues and mineral packed herbs, Organic Milkmaid Tea helps keep breast milk flowing from healthy mama to healthy baby. 16 bags. ORDER NOW! Ingredients: Foeniculum Vulgare (Organic Fennel) Seed, Trigonella Foenum-Graecum (Organic Fenugreek) Seed, Rubus Idaeus (Organic Red Raspberry) Leaf, Urtica Dioica (Organic Stinging Nettle) Leaf, Silybum Marianum (Organic Milk Thistle) Seed, Citrus Sinensis (Organic Orange) Peel, Pempinella Anisum (Organic Anise) Seed, Carum Carvi (Organic Caraway) Seed, Medicago Sativa (Organic Alfalfa) Leaf. • Morning Wellness Tea: When every little smell is suddenly a challenge and those morning nausea often last all day long, 100% organic ginger-minty Morning Wellness Tea is a soothing way to help get you through the day! Made with stomach-settling Ginger Root and Spearmint, a safe hint of Peppermint, and calming Chamomile and Lemon Balm with a luscious twist of Orange Peel for flavor. Naturally caffeine free. Steep, sip and enjoy!. 16 bags. ORDER NOW! • Peaceful Mama Tea: USDA Certified 100% Organic Peaceful Mama Tea combines soothing herbs in a delightful blend to help relieve a mama's busy head and stressed body. Works for anxious papas too! Made with tension easing Lemon Balm, calcium rich Oat Straw, soothing Chamomile, and a scent of Red Raspberry Leaf and Orange Peel to assure you a heartening drink! Enjoy a comforting cup of Peaceful Mama Tea before bedtime. Then settle down, be at peace and admire that you are growing your beautiful angel baby, naturally. Caffeine free. . 16 bags. ORDER NOW! • Third Trimester Tea: Organic Third Trimester Tea is a tasty blend of vitamin and mineral packed herbs to nourish all those mama parts preparing for the happy arrival of your angel baby. Combined with 100% organic herbs, including Red Raspberry Leaf, iron-rich Stinging Nettle, soothing Chamomile and Rosehips, and calcium filled Oat Straw; Third Trimester Tea is a splendid gift to mamas-in-waiting. Caffeine free. 16 bags. ORDER NOW! Ingredients: Zingiber Officinale (Organic Ginger) Root, Mentha Spicata (Organic Spearmint) Leaf, Matricaria Recutita (Organic Chamomile) Flower, Citrus Sinensis (Organic Orange) Peel, Melissa Officinalis (Organic Lemon Balm) Leaf, Mentha Piperita (Organic Peppermint) Leaf . • Nursing Tea: Weleda Nursing Tea is a delightful, soothing breastfeeding herbal drink that supports healthy lactation of both mother and eventually the child. Made with Lemon Verbena and Fennel in this herbal breastfeeding tea soothes and comfort mothers. Nursing Tea is a exclusive blend of organic herbs nourish and reconditions you with a sense of tranquil. Helps provide you with warm, serene comfort that you pass on to your baby. 20 Tea Bags. BUY NOW! 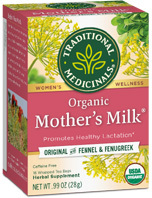 Ingredients: Fenugreek Seed, Anise Seed, Fennel Oil, Caraway Seed, Lemon Verbena Leaves..
• Women's Tea Mother's Milk: Mother's Milk® help nursing mothers support their production of breast milk and to support healthy lactation. Combined with Fennel and Anise (which give the tea a sweet, licorice-like taste), and Coriander and Fenugreek. Sweet, faintly bitter with a distinct licorice-like taste. 16 Tea Bags. ORDER TODAY! • Women's Tea Raspberry Leaf: Raspberry Leaf tea helps support healthy menstruation, tones the uterus and may be used for menstrual cramps. Raspberry leaf have been used by European and Native American women for thousands of years for menstrual support, menstrual cramps and during pregnancy as a healthy tonic to help prepare the womb for childbirth. Has gentle nurturing properties and full-bodied taste, which is notable of a mild fruity black tea. Flavorful like a fine black tea and caffeine free. 16 Tea Bags. ORDER TODAY! • Women's Tea Pregnancy Tea: Pregnancy® Tea is a blend of supportive herbs to help tone the uterus and prepare the womb for childbirth. Combined with Raspberry, Nettle leaf, and Alfalfa for a pleasingly mild, minty taste and for its gentle support of a healthy pregnancy. Mildly sweet and Spearminty. 16 Tea Bags. ORDER TODAY! • Women's Tea Back on Tract: Back on Tract Tea encourages and maintains urinary tract health. Made with Java tea and Cornsilk to help your body remove waste and extra water through the urinary tract – with Hibiscus and Cranberry for a rich and fruity taste. Rich and fruity, pepperminty and slightly sweet. 16 Tea Bags. ORDER TODAY! 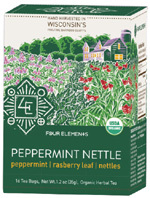 • Women Tea Peppermint Nettle: Peppermint Nettle Tea (Fortifying Mint) is blended with stimulating Peppermint and several herbs to make a grand beverage after a meal or for a pick-me-up any time of day. The blend comes from the Madison Birth Center, who designed it for new mothers to drink after childbirth. 16 ct. BUY NOW! Ingredients: Peppermint Leaf, Raspberry Leaf, Nettle leaf, Alfalfa leaf, Oats and Oatstraw. TEA: Women Tea: Peppermint Nettle, 16 ct.
• Women Tea Womankind: Womankind Tea helps women balance and bloom. The flowers in you are ready to bloom, a caring cup of nourishment is all it takes to stimulate them to life. Womankind Tea is made with the delightful ruby-red Cranberry with the tender press of Rose, the softness of Shatavari and speckled with Vanilla's sweetness. Harmonizing happiness indeed for the girl who's looking to sail through the week. May you flourish! 20 Tea Sachets. BUY NOW! • Raspberry Zinger: The unique sweet-tart flavor and tempting fragrance of American-grown Raspberries are the perfect balance for fruity Thai Hibiscus and tart and tangy Chinese Hibiscus in this flavorful herbal blend. Relaxing when served warm, this blend is nourishing and energizing when served as iced tea. 20 bags. ORDER TODAY! • Cranberry Apple Zinger: This energetic blend creates the exclusive flavor of fresh, homemade cranberry sauce. Combined with lively, antioxidant-rich Cranberries, juicy Apples, and exotic Yumberries, a healthy Asian fruit also known as a 'Chinese strawberry.' This vibrant tea is festive enough to be your Christmas tea and comforting enough to enjoy hot or iced year-round. 20 bags. ORDER TODAY! • Organic Woman's Moon Cycle: Woman's Moon Cycle contains herbs to help soothe the minor tensions and discomfort of your monthly cycle. Made with Dong Quai, Chaste Tree Berry and Organic Raspberry Leaf to help relieve common menstrual discomforts. Added fragrant Chamomile to help unwind and calm the mind and body. Promotes harmony and comfort into the days of your monthly cycle with a soothing cup of Woman's Moon Cycle. 16 bags. ORDER TODAY! • Organic Woman's Nursing Support: Woman's Nursing Support helps generate such an ideal and necessary connection while breastfeeding your baby. Blended with stimulating Fennel, Fenugreek and Anise to help promote lactation. Made with Chamomile for its sweet, apple-like fragrance and soothing Lavender Flower to support relaxation help calm the minor stomach upset that sometimes accompanies nursing. Get relief one delicious sip at a time. 16 bags. ORDER TODAY! 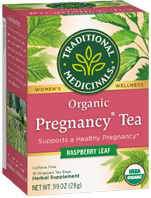 • Organic Woman's Raspberry Leaf: Woman's Raspberry Leaf tea is a mild and organic blend to support the female system. Raspberry Leaf has been traditionally used by midwives and Western herbalists during pregnancy, to help relieve the discomfort of menstruation, and to fortify and tone the uterus. 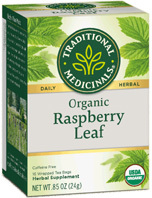 Savor the enjoyable, earthy-sweet flavor of organic Woman's Raspberry Leaf tea for well-being at all stages of life. 16 bags. ORDER TODAY! • Organic Woman's Energy: Woman's Energy is a wonderful way to enrich your overall well-being and utilize your feminine energy during all stages of life. Formulated to work with your body, Dong Quai to support reproductive health and to help balance and ease you through your female cycles. Made with sweet Fennel, Anise and lively Orange Peel in this stimulating blend leaves you vigorous and graceful. 16 bags. ORDER TODAY!